Long, long ago, there were two creator gods, a God and a Goddess, who got together, in darkness, to talk about the creation of our present world. 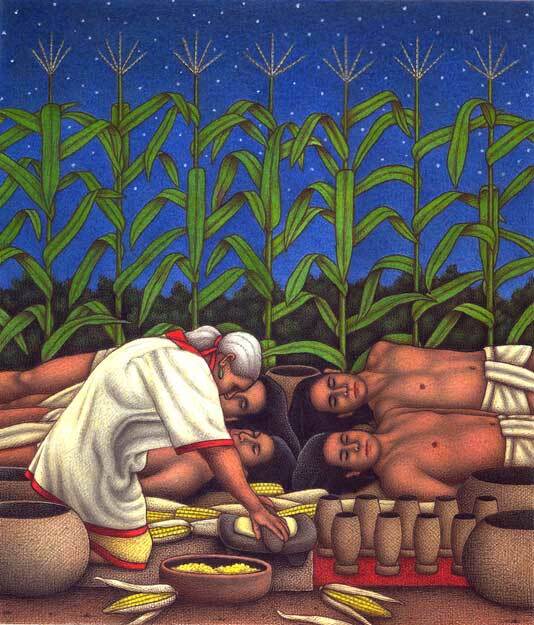 The humans’ flesh was made of white – that’s male – and yellow – that’s female – corn. Their arms and legs were made of corn meal. The gods ground enough corn to make enough gruel to fill NINE gourds, that gave the men muscles, strength, and power. 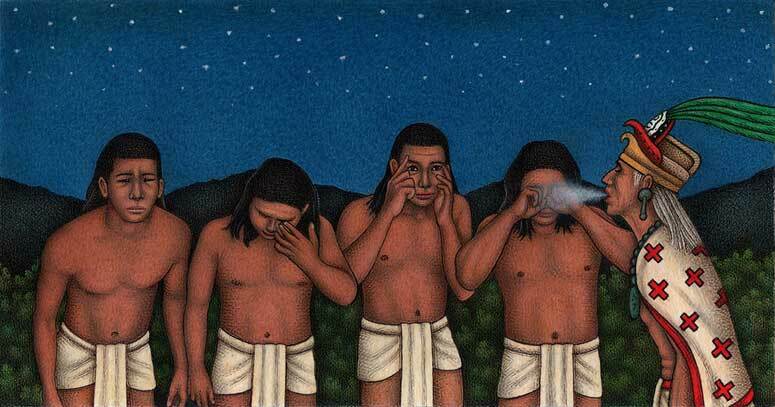 These first men could speak, hear and see, and had enough feeling in their hands to hold things. They were given intelligence and could see for miles and miles. They could see things both near and far up in the sky. They even managed to see all four corners of the earth... In fact, they could see so much that the Gods thought about it, and said ‘Wait a minute, that’s no good! We’ve given these people so much power that they are just like us! ‘We must cloud their vision so they can no longer see all that we see.’ So they threw a mist over the people’s eyes and their vision blurred, as when one breathes on a mirror. From then on, they could only see what was near to them. Then the Gods decided to make partners for them. While the men slept at night, four women were placed beside them. When the men finally woke up, they were amazed at the Gods’ creations! Many nations were created and multiplied. 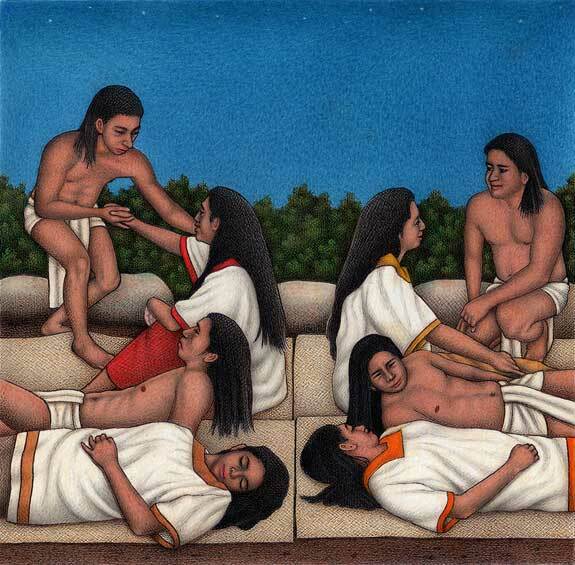 There were dark-skinned and pale-skinned people. 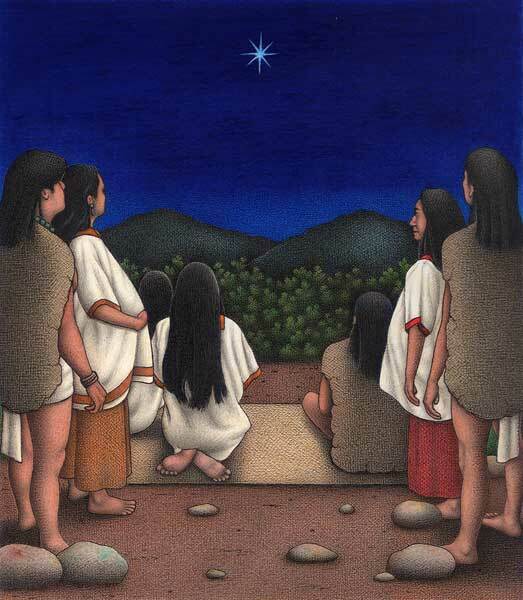 In the beginning they all shared one language, and all remembered the words of the creators and gave thanks to them. Images all by and © Luis Garay/Mexicolore. NOTE: There are differences in translation/interpretation between versions of the Popol Vuh. Montejo writes of two Creator Gods (nominally male) whereas others suggest a Father-Mother creator couple. 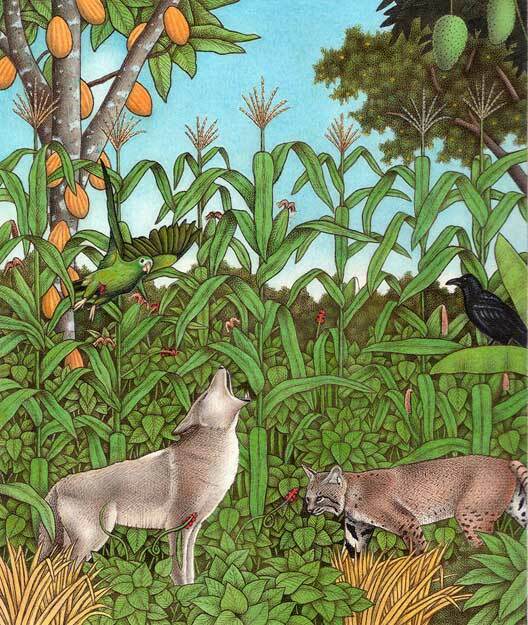 In some versions the jaguar is replaced by a fox, etc. This part of the Popol Vuh comes some 2/3 of the way through the original book.